The first time I saw “Welcome to the New Union” by Gil Mualem-Doron was at Turner Contemporary in Margate as part of the Platforma South East Exhibition last summer. From the moment I arrived until the time the gallery closed, he was busy taking photographs, positioning sitters and, most importantly, engaging people in conversation. 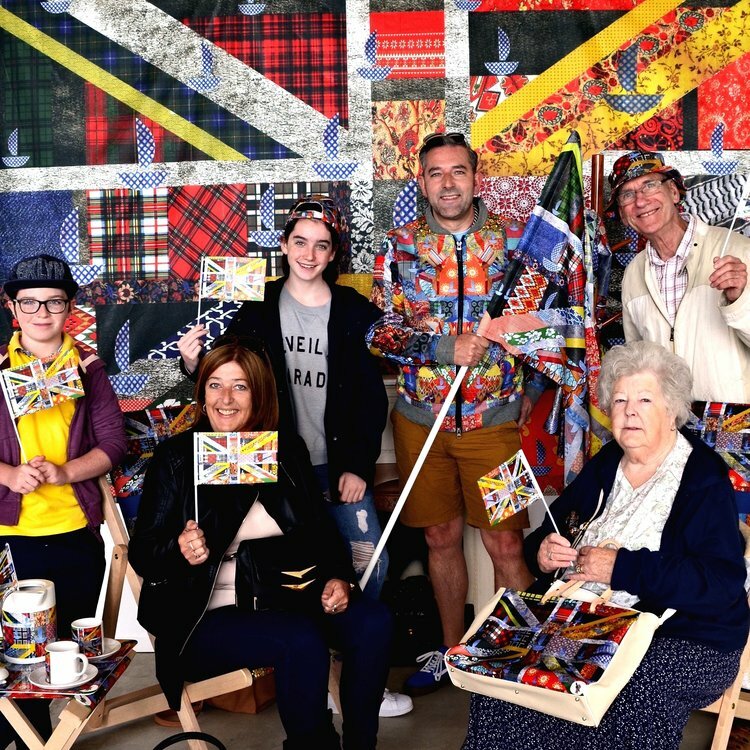 As Gil explains elsewhere on this blog the New Union Flag is a reworking of the Union Jack featuring textiles connected to people from different ethnicities and national backgrounds. Gil’s installation, created especially for the show, was based around a large reproduction of this flag in front of which he invites people to be photographed on a small set featuring New Union Flag adorned hats, mugs and other paraphernalia. Margate seemed like a perfect location for this work. In a gallery that looked out onto the ocean, it was a humorous take of the traditional seaside photograph featuring both deckchairs and umbrellas. And Gil went about his work like a traditional seaside photographer – friendly, engaging, occasionally cajoling in order to get a good shot. What fascinated me was the public response. Before seeing the installation I had viewed the New Union Flag as overtly political, a textile takeover of the central symbol of British colonial identity, a direct challenge to the ongoing imperial narrative. In the Turner Contemporary, however, Gil’s work was not a polemic, it was an open invitation to participate. In the first place, I think, it is the beauty of his flag that attracts people. It is a stunning object. Bright, cheerful and optimistic. We might be aware that it is a subversion, but who could be offended by something so beautiful? The installation then directly invites audience engagement. The props, the dressing up, the riot of colour and patterns – few are able to resist. And then there is Gil. He has, of course, considered this installation very carefully. Inviting people in, being generous in taking their photo and offering them a free digital copy, is central to the work. Because he also talks to them. They ask him questions about the flag and his answers require people to think again about what a national flag means and what it could mean. And, therefore, what national identity means and could mean. 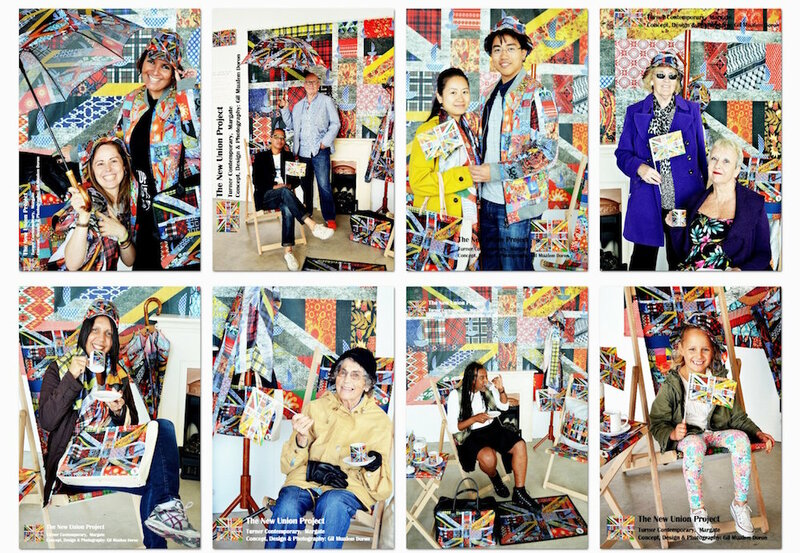 The exhibition in Margate took place shortly after the Brexit referendum. Among the crowds of visitors was a local UKIP councillor. Gil spotted her. And noticed her do a double-take as she considered what her response should be to his work. She did not seem inclined to be offended, but perhaps wondered if she should have been. 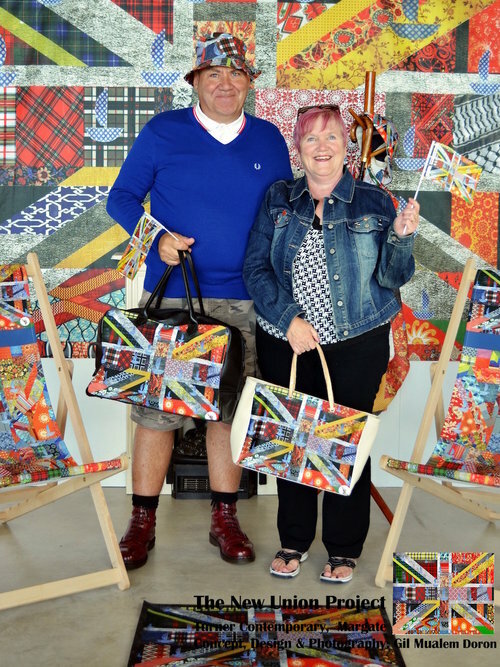 Her grand-daughter showed her the way, first busy playing with a New Union Flag jigsaw and then eager to be photographed sitting in a New Union Flag deckchair, wearing a New Union Flag sunhat. “Welcome to the New Union” lends itself to such moments because Gil is such an accomplished and subversive artist. And because as a person and an artist he has such integrity. At a time when national identity is being used so divisively in political contexts, the New Union Flag, is an idea that’s time has surely come.